In the picture above, north is at the top and the image covers 68.1 x 54.5 degrees. Image centre is located at 09:49:57.6, -34:53:33 ((H:M:S, D:M:S), J2000) Astrometric data from Astrometry.net. Antlia (originally Antlia Pneumatica, the Air Pump) is an unremarkable constellation invented by the Abbé Nicolas de Lacaille in the 1750s. It is hemmed in by the meandering body of Hydra to the north and the sparkling constellations of the Milky Way to the south. It contains a fine planetary nebula, NGC 3132 and a beautiful spiral galaxy, NGC 2997 (see below). Pyxis (Pyxis Nautica, the Mariner's Compass) is the least interesting fragment of the great vessel Argo Navis, dismantled by the International Union in the 1930s. The other parts are Puppis (the stern), Carina, (the keel) and Vela. We also offer an alternative view of Pyxis and a more detailed description. 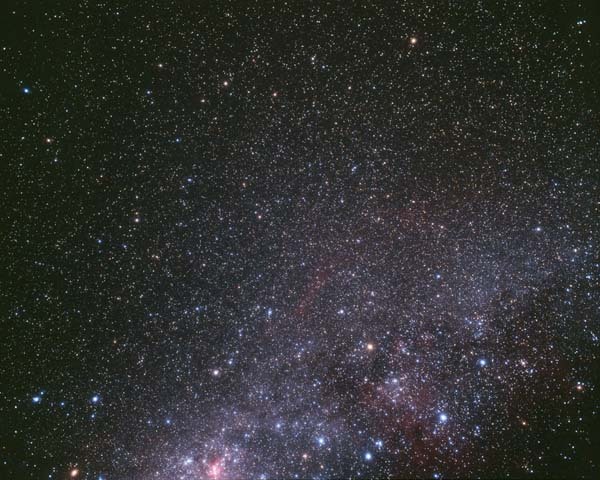 Vela (the sails) is best known for the supernova remnant seen on large telescope pictures (below) and the Gum nebula, visible as faint red nebulosity towards the right (west) of the constellation. Named stars: Antlia, Pyxis and Vela contain few named stars.